Our Hershel is a noble Elder Statesman who deserves to live his golden years in the lap of luxury and love. Seven years young, our handsome gentleman was found afoot in a New Jersey neighborhood, where he had been stray for some time. Animal Control Officers brought him to the City pound, where every attempt was made to track down his owners. When nobody came to claim him, Hershel was sent to us so we could find him a forever home. 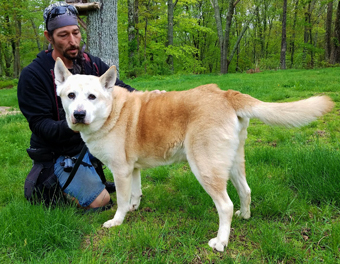 Even though this grand soul received wonderful behavior evaluations, he was passed over in the adoption program due to his age. Seems as though everybody wants to experience puppy hell, and too few people appreciate the considerable benefits of having an older dog, who is well past the puppy mayhem stage. Hershel has an animated, congenial nature, and the shelter experience did not leave much of a mark on him. He came to us full of confidence, amenable to all, and extremely adaptable to varied circumstances. Hershel is a lively fellow, who has good dog pack manners. He would thrive in a multi-dog home with other good natured dogs, who also have good pack manners. 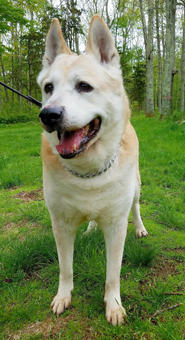 He would also be a wonderful companion for an active senior dog, who may have lost his or her housemate. 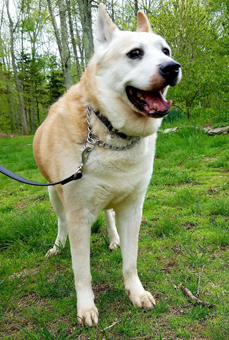 Hershel appears to be a predomantly Husky, likely mixed with Shepherd. He is a large, muscular dog, with a stocky build at 72 pounds. He's a strong dog, yet gentle to handle and easy to walk on lead. His short, fluffy coat is easy to groom, with some shedding all year. Hershel is mostly tan in color, with cream markings on his face and feet. He has a proud Husky stance, with plume tail. Hershel seems most like Husky in personality, in that he seems independent and somewhat aloof at times, and thrives in the outdoors. 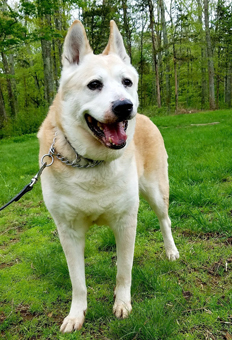 We see Hershel as an ideal walking or hiking companion, and he would be a great choice for a moderately active single or couple, or a recent active retiree. 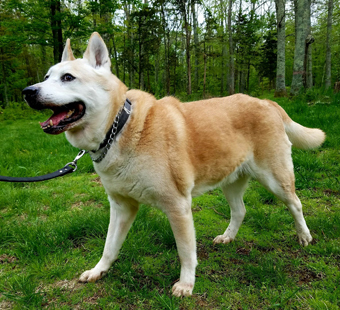 He has a moderate exercise level, and would be a great companion to anyone who enjoys the outdoors, or a family with older children who appreciate an independent dog who needs his space at times. Hershel would be happy with a couple of leisurely to brisk leash walks daily, and a game of frisbee. He could easily do well in an apartment lifestyle, and as a mature dog, he can be trusted home alone for short periods of time. 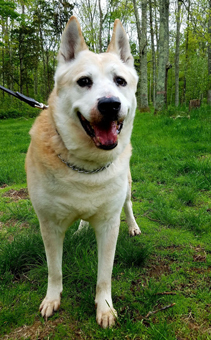 Hershel is a pretty good all-around companion dog, and would thrive in an active lifestyle, where he has some freedom to investigate the sights and sounds of nature. Hershel is not a clingy dog at all, he appreciates his space and likes to do some investigating on his own terms. Hershel had not had much obedience training, but he has quickly mastered the basics. He is treat motivated, and very responsive to positive reinforcement and Leadership training techniques. Hershel has good house manners, and is house trained and crate trained. Adopters should expect to troubleshoot the occasional accident that will inevitably occur during his transition to a new home. He has been neutered, and has been vaccinated for Rabies, DHLPPC (distemper, hepatitus, leptospirosis, parvo, parainfluenza, coronavirus). He has been boostered as needed. He has had the 4dx test: and has been treated for a minor tick borne bacteria. He has been dewormed, microchipped and is on preventatives for Heartworm and Flea/Tick. 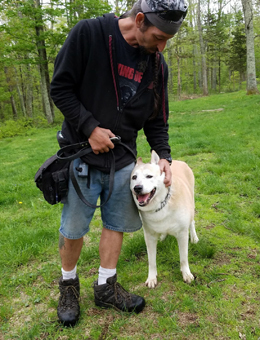 If you are interested in Hershel, please write to Denise@eskiesonline.com or call Denise at 860-908-9738 for more info.